This children’s show has been devised specifically for Arts Centres, Schools and Intimate Theatres. Following on from the Harry Potter films this show includes plenty of magic and wizardry. The Show is performed by Wizz-about the Wizard a.k.a. Mel Harvey who is himself a Member of The Inner Magic Circle with Gold Star. Apart from the award winning magic the show includes singing with the guitar, balloon modelling and plate spinning with plenty of audience participation in the Wizard Games. No stranger to Pantomime Wizz-about has also starred in Aladdin as "Wishee Washee". The Show runs for approximately one hour without a break and is suitable for children from four upwards. Where a sound system is not available this can be supplied with mini-disc player together with red plush stage drapes. Igor the Owl puppet is featured in the show much to the delight of the children. All the children who come dressed as Wizards will be able to enter "The Best Dressed Wizard Competition" and could win a Wizard prize. A wizard painting competition is included in the Show’s publicity with still more Wizard Prizes to be won. 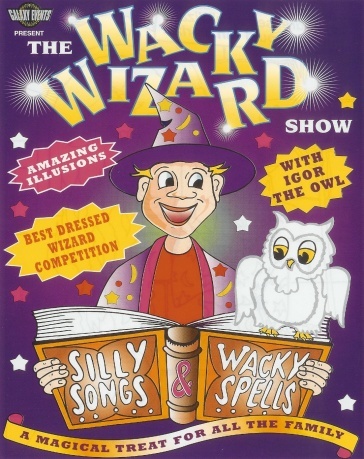 The Wacky Wizard Show has already played The Grantham Arts Centre and The Quay Arts Centre on the Isle of Wight to full houses with over half the children coming dressed as Witches and Wizards! !